The HTML to PDF	component in a flow can convert text to PDF format. 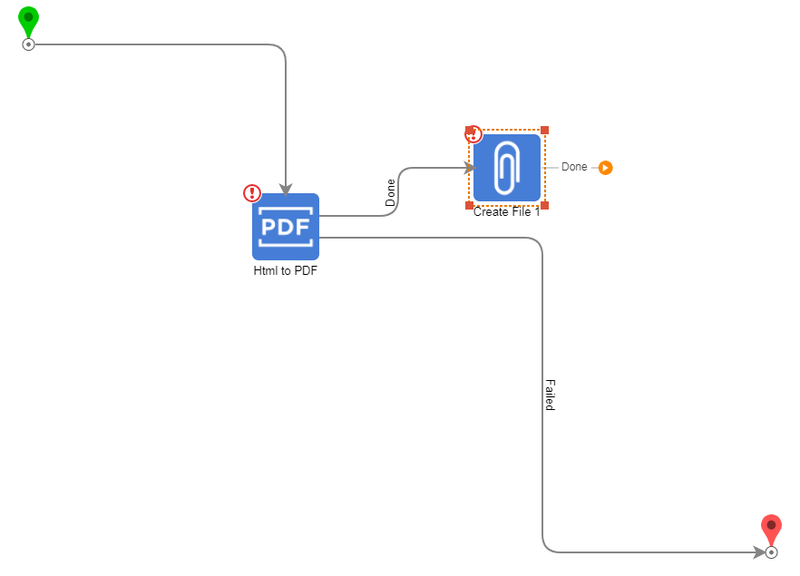 When used in a flow, this step reads in an HTML or text file, then converts it to PDF. This step does not actually create the file; it works in conjunction with the Create File	step. The HTML to PDF	component is found in the Toolbox	, under Data > PDF	. 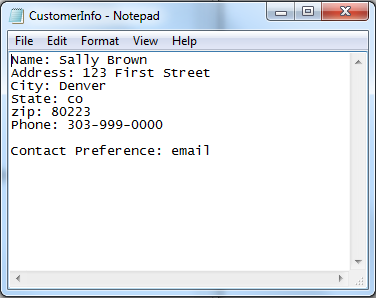 This example reads in an HTML file that contains customer information. A company wishes to capture this information in PDF format so it cannot be edited. The HTML to PDF	step outputs a file of FileData type, which is read in by theCreate File	step, which actually creates the file itself. In a Designer Folder , create a new flow. 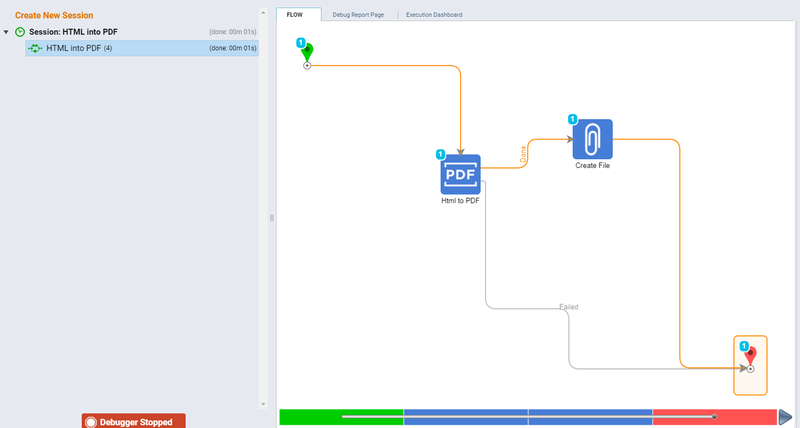 From the Flow Designer&apos;s startup window, expand All Steps [Catalog] >	Data > PDF	. Select an HTML to PDF	component and click Add	to place it into the workspace. Click on the HTML to PDF	step. From the Properties	panel, set its configuration. In theInputs > FileName	field, select the appropriate mapping type and enter a name for the HTML file. For example, a mapping type of Constant	and a constant value of CustomerInformation . 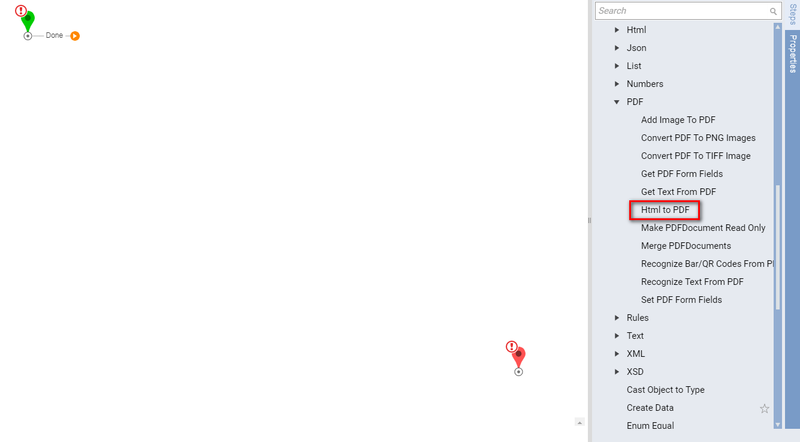 In theInputs > HTML	field, select the appropriate mapping type and specify the HTML file. For example, a mapping type of Constant	and browse to a file CustomerInformation.html . The Outputs	section fields will be left as-is for this example. Next, from the Toolbox	, expand the Integration > File	category, and drag and drop a Create File	component to the workspace following the HTML to PDF	step. Connect the Done	path of the HTML to PDF	step to the Create File	step. Connect the Failed	path of the HTML to PDF	step to the End	step. Click on the Create File	step. This example reads in data from a file upstream of this step; therefore, the variable will be selected as input. 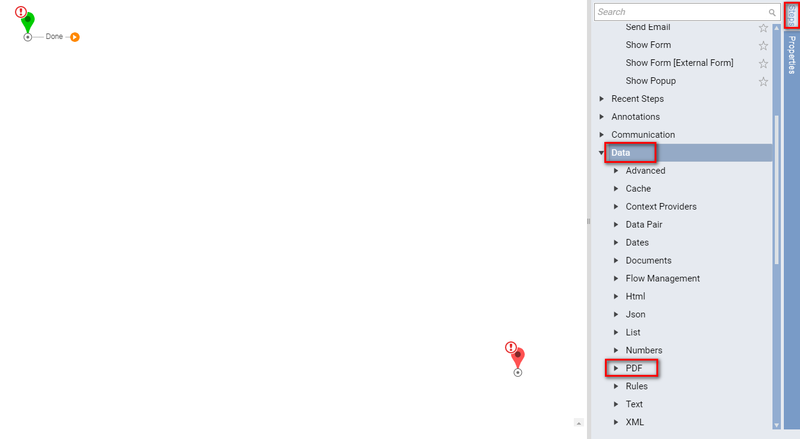 From the Properties	panel, click on the Inputs > Data > Mapping Type	drop down list and select Select Value	. Browse to PDF File.Contents	and click OK	. 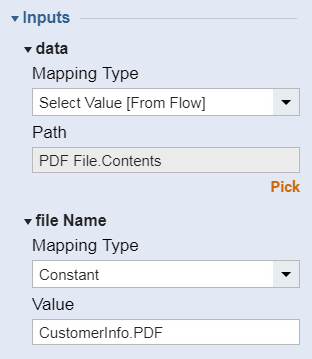 Under Inputs > FileName	, select Constant	as the mapping type and enter a name for the PDF. If desired, include a path to where you want the file to be saved. By default, if no path is specified, the file will be saved to the DecisionsDecisions Service Manager directory. Connect the Done	path of the Create File	step to the End	step. This completes the flow. Click the Debug Flow link at the top of the workspace. 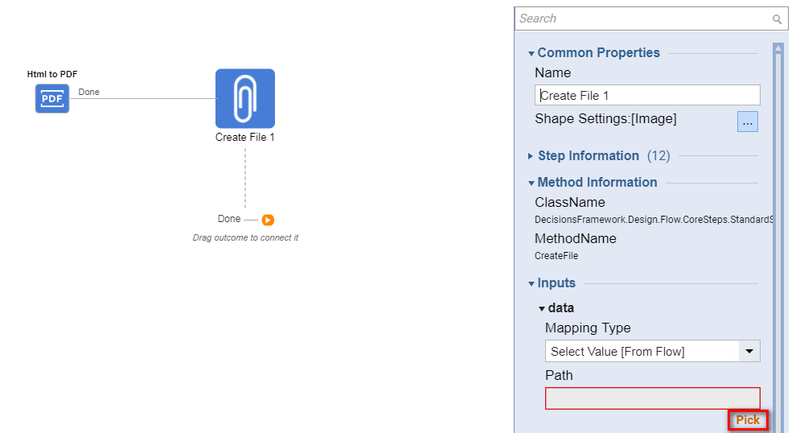 Note that in Decisions version 4.0 and above, you’ll need to click on Debug Flow	to access the Debugger. 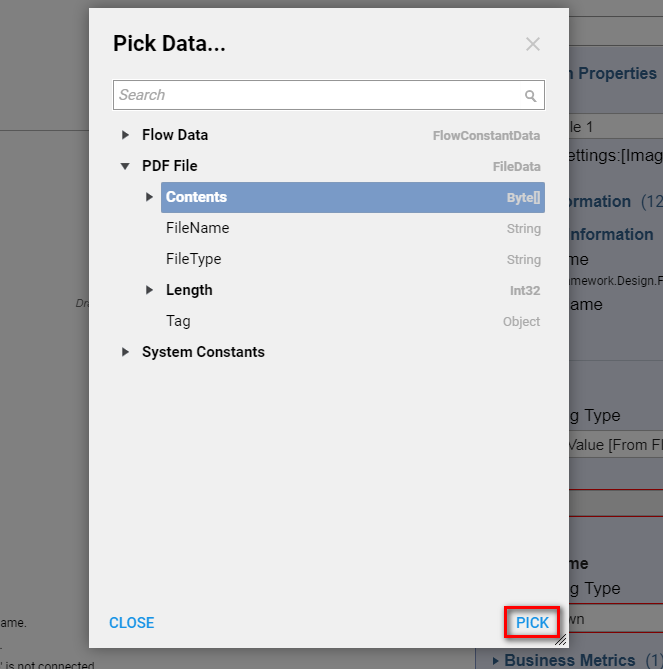 Run the flow, and then browse to the Decisions > Decisions Service Manager directory (which is where generated files are saved by default). Open the customer history PDF file and notice it contains the content of the .HTML file.